This pretty crocheted baby blanket features lacy stripes of color. The finishing touch is a dainty edging with V stitches and picots. I've crocheted my sample blanket in cool pastel colors -- baby blue, mint green and lavender purple -- but feel free to substitute any colors you like. This colorway was crocheted in pastel colors of Bernat Softee baby yarn. (Compare prices.) Bernat Softee is an acrylic yarn; it is rated as a 3 on the yarn weight system used by the Craft Yarn Council. This is also known as "double knitting" weight or "light worsted" weight. I used less than one 140 gram / 5 oz. ball of each color to make the baby blanket sample. This afghan would be lovely if crocheted in a soft cotton yarn. It would also be gorgeous in other colors; I'd love to try it in bright colors instead of pastels. Feel free to make yarn substitutions as you like. This hook size is just a suggestion. 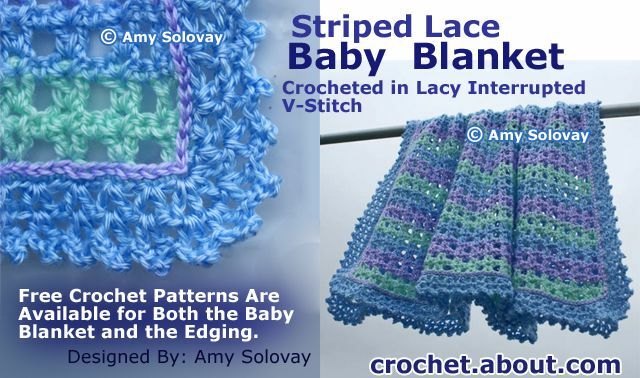 Your way of crocheting is unique, and a hook size adjustment might be necessary for you to obtain the proper gauge for this baby blanket pattern. Work 1 dc st, 1 ch st, and 1 more dc st in same ch or sp. The body of this baby afghan is worked in lacy interrupted v stitch. Before adding the edging, the baby blanket measures approx. 27" x 30". After adding the edging, the baby blanket measures approx. 30" x 33". 5 stitch repeats = 6"
If your crochet stitches are larger or smaller than the stitches used to crochet the sample, your baby blanket will be either larger or smaller. You don't want the blanket to end up being too small for even the tiniest preemie, or so large that it overwhelms the baby. If your stitches are significantly larger than the stitches used to crochet the sample, you risk running out of yarn. Adjust hook sizes as necessary to achieve the correct gauge. The starting chain for this stitch pattern is a multiple of 4 + 9. If you'd like to make your baby blanket larger or smaller than my sample blanket, adjust your starting chain accordingly. Work 75 rows in lacy interrupted v stitch, or until your blanket measures the length you want it. Be sure to end with a V-stitch row, so that the upper edge of your blanket will be straight. You can choose any edging you like for this afghan, but I did design an edging that coordinates well with it; see the lacy vs and picots baby afghan edging. When you are finished, be sure to weave in all your loose ends securely. We hope this baby blanket pattern is exactly what you're looking for...but if it isn't, you are invited to browse through our free baby blanket patterns (and other baby patterns) to find more choices that will hopefully meet your needs.